Shop at a Gap Factory store and get 40% off the entire store during their Victoria Day Sale from May 16-23, 2011! Plus, you can save an additional 15% off your purchase if you spend $85 or more. This offer is not valid at Gap brand stores or online. In order to take advantage of this sale, you will need to print the coupon below and present it to a cashier during checkout. 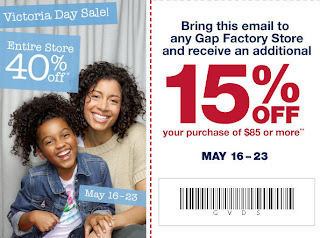 Click here to print the Gap Factory Store coupon. Visit your nearest Jacob store today and get 30% off on one regular priced item. This coupon applies to Jacob and Jacob lingerie stores but not Jacob outlet stores. Some additional conditions apply. Click here to print the Jacob 30% off coupon. 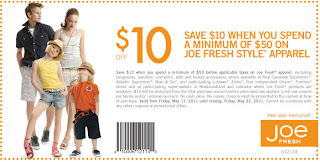 From now until May 22, 2011, spend $50 or more on Joe Fresh Style apparel and get 10% off when you present this printable coupon. One coupon per family/customer. Additional conditions apply. Click here to check out Joe Fresh Style online or to print out the coupon. 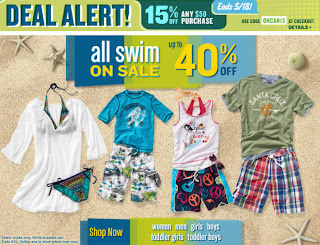 Until May 22, 2011, Old Navy is having up to 40% off on swimwear and swim accessories. Plus shop online until May 18, 2011 and get 15% off on any purchase of $50 or more. Use the promo code ONCAN15 at checkout to receive the discount. Click here to shop Old Navy online now or for more information about the deal. 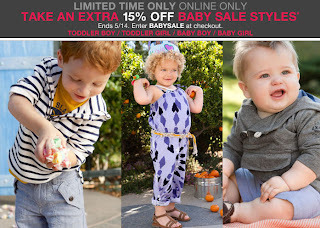 Shop Gap online and save an additional 15% off on baby sale merchandise by entering the promo code BABYSALE at checkout. This offer is valid until May 14, 2011. Some additional conditions apply. Remember that shipping is free on any order over $50. Click here to shop Gap online now or for more information about the deal. 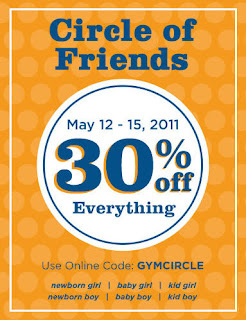 From now until May 15, 2011, Gymboree is having a 30% off everything when you shop online. Simply use the promotion code GYMCIRCLE at checkout to receive the discount. I would encourage taking advantage of this offer. I hear that Gymboree has really nice clothing styles for children and the quality is very good. Click here to shop Gymboree online now or for more information about the deal. 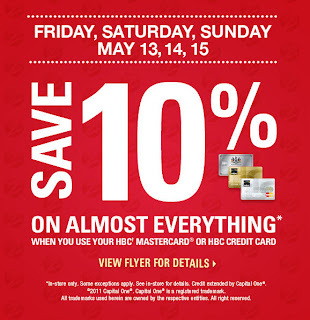 Shop at a Zellers store today, Saturday and Sunday (May 13-15, 2011) and receive 10% off on almost everything when you use your HBC credit card or HBC mastercard. Some exemptions apply. Please see in-store for details. Click here for more information about the 10% off offer at Zellers. 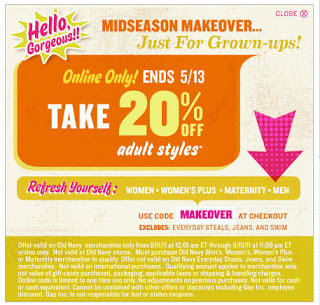 Check out Old Navy’s Midseason Makeover Event online, from now until May 13, 2011, to get 20% off on adult merchandise. This promotion includes purchases of men’s, women’s, women’s plus, or maternity merchandise, and excludes everyday steals, jeans, and swim merchandise. Use the promotion code MAKEOVER at checkout to receive the discount. Some additional conditions apply.